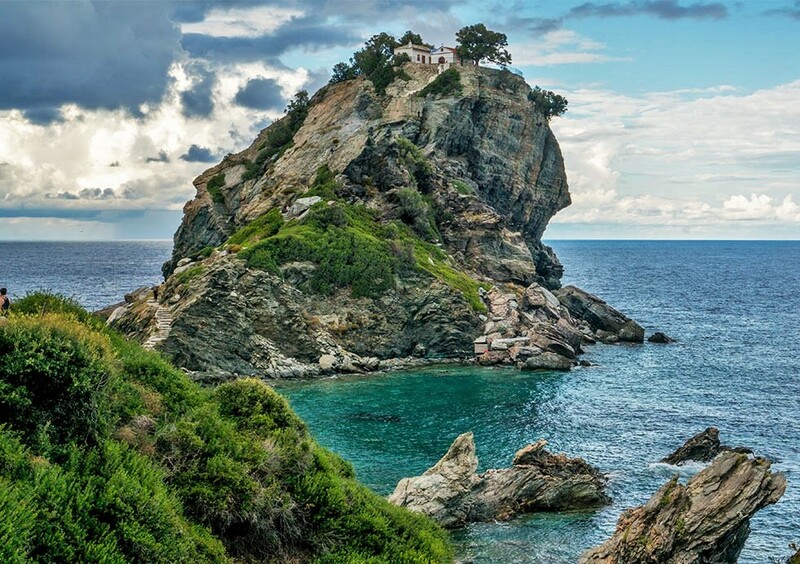 In the north, the beautiful small town of Skopelos is built with the tightly enclosed houses that surround the Castle and go down to the harbor. Among the houses, there are numerous small churches and picturesque narrow alleys that are often interrupted by landings and stairs surround the neighborhoods. The village of Glossa is the second largest settlement in Skopelos. It is located northwest of the island and is built on the hill above the port of Loutraki from where you can enjoy the breath-taking view of the natural landscape that will definitely blow your mind. Shortly before reaching Glossa, on your right, you come across a road that leads to the chapel of Ai Giannis at Kastri. The chapel of Ai Giannis is at the top of a rock 100 m high and to reach it one must climb about 200 steps cut into the rock. Before the road reaches the sea, there is a tap with water at the chapel of Panagia. The visitor climbs up a well protected staircase cut into the rock. The view from the top is mesmerizing. The small, almost lonely beaches with their green-blue waters among the grey rocks add one more tone of beauty to the area. This photo is from Costas Andreou. It was taken from mount Delphi and shows the heart shape that is formed when you photograph Emplo bay and a part of Panormos beach from that distance. ﻿Visit the Kastani beach. It's where the trees meets the sea! It's a beach with rear beauty. Also visit the Milia beach!